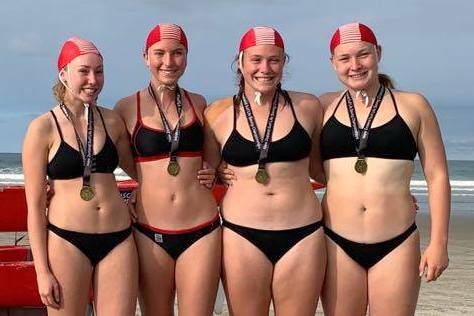 The recent NZ Surf Lifesaving Championships at Mt Maunganui saw Red Beach athletes standing atop the podium on three separate occasions. Kees Kramer, pictured above, scored a major triumph in winning the highly coveted U19 Ironman title. 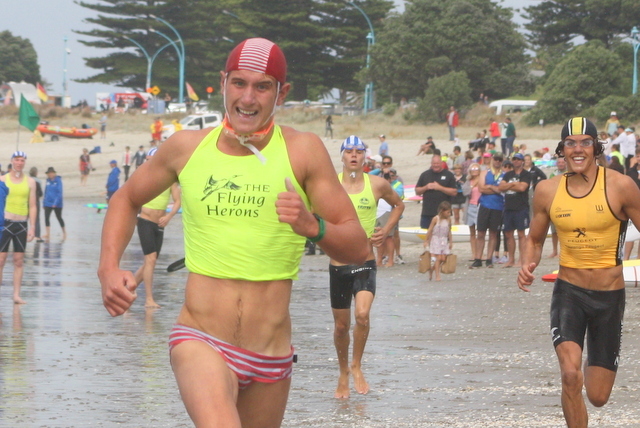 In the final swim leg of the event he connected with a wave which saw him emerge first from the surf and sprint to the finish flags, heading off Declan Dempster from the host club. Coincidentally, it was on the same beach in 2011 that Red Beach athlete Chris Moors won the NZ Open Ironman title. The last NZ U19 Ironman title to be won by a Red Beach athlete was AJ Maney who took it out at Ohope Beach, Whakatane in 2010. The Red Hot Chillis canoe crew of Beth Enright, Keeva Marinthe, Georgia Parker and Taryn Banks won Gold in the U19 Women’s Long Course Canoe final which was raced in gnarly surf conditions. The crew also collected a Bronze in the U19 Short Course final. Kalani Gilbertson, above, snared a Gold medal in the U16 Men’s Ski Race final after leading from start to finish. It was a highly impressive win in which he was able to call on his kayaking ability and surf handling skills to see him first across the finish line.